Joe Hetrick (407) and Joey Webb (411) negotiated the tight turns on the singletrack along the east edge of the Fort Lewis College campus Friday afternoon. They helped the BHS boys to a third-place finish. Eva-Lou Edwards of Bayfield won her second cross country race of the season Friday at Fort Lewis College. 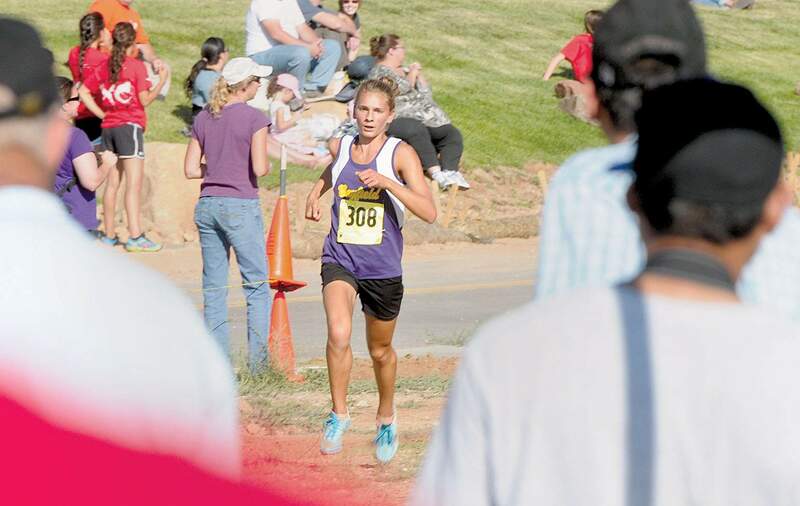 Edwards paced herself, then won the Southwestern Cross Country Challenge 5-kilometer race in 19 minutes, 11 seconds. Bayfields Eva-Lou Edwards listened to her coach. And no, he didnt tell her to kick her second serve wide in the deuce court. No, coach Pat Vaughn had much simpler advice for the cross country runner/tennis star: Do not take the lead. My coach told me to stay with (Shannon Maloney) the first lap and try to pass her on the second lap, Edwards said after winning the girls varsity race at the rebranded Southwestern Cross Country Challenge on Friday afternoon. Edwards, heeding Vaughns advice, passed the Demons Maloney on the second 1.5-mile lap on the trails along the east side of the Fort Lewis College campus. I was just trying to listen to my coach, said Edwards, who plays tennis for Durango High School because BHS doesnt have a tennis program. Twice Edwards has qualified for the state tennis championships for the Demons. This time she chased a Demon for a mile and a half before winning her second cross country race of the season. She also won the Prestate Invitational two weeks ago in Aurora. Maloney and Edwards led from the start. We were both settled in. We were both comfortably getting through the race, Edwards said. After her second-lap surge, Edwards  daughter of Paul and Vivian Edwards  won in 19 minutes, 11 seconds. Maloney was second at 19:33. Emily Bryant of Pagosa Springs finished third. I told her, Do not lead that first lap, Vaughn said of his prerace instructions. And she did exactly as she was told. She ran a great race, he said. Edwards helped the Bayfield girls to a third-place finish with 67 team points. Durango won with 27, while Page, Ariz., finished runner-up, three points behind the Demons. Aubree Lorenzen was the No. 2 runner for Bayfield. She finished 16th (22:26), then was followed by Wolverines teammates Nicole Cyr (19) and Danielle Miller (31). The BHS boys (69) also finished third Friday. Page won with 22 points, and Durango finished second with 37. 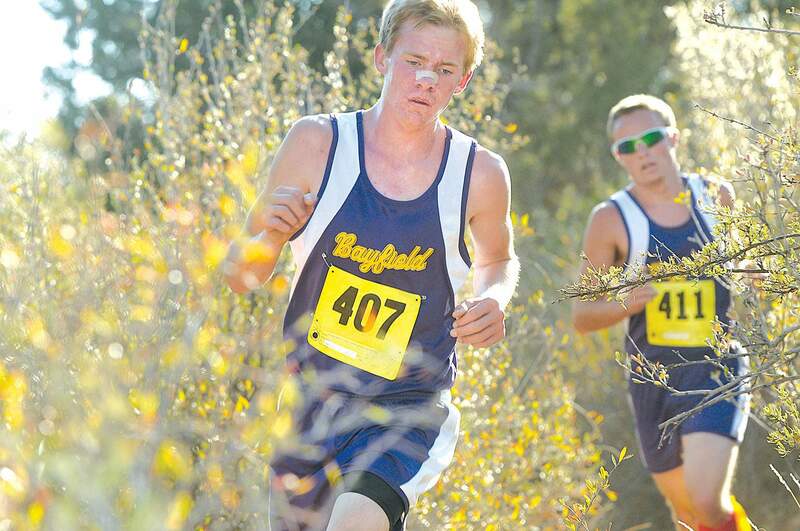 Freshman Trevor Gabbard placed sixth for Bayfield (17:49). Luke Webb was ninth (18:00), Joe Hetrick finished 23rd and Joey Webb 31st. Bayfield also collected a victory in the middle school girls race from eighth-grader Bridget Goddard.